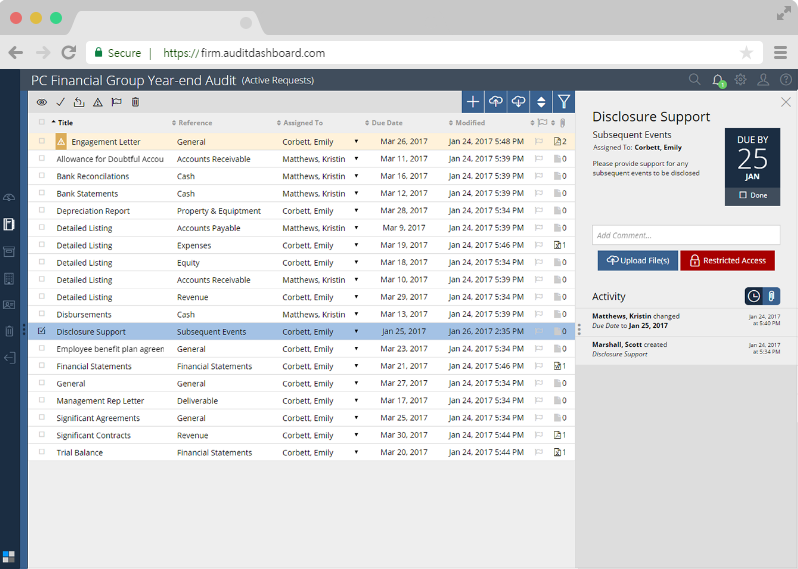 Improve the information collection process by streamlining communication using AuditDashboard. it's easy to keep track of inquiries, files and automatically track what's outstanding. Easily search for key words, sort by clicking a header and filter by status, to find what you are looking for, when you need it. Notify a client that you have added a new request or that you need them to look at something by upgrading the request's status to high importance. Securely designate who can see what and when, by Restricting Access per user(s) and per requests for confidential items. Rollover this year's request list to ensure you that you start next year's engagement with a complete list. Centralize communication and file management to eliminate information silos that destroy productivity. Prevent duplicate requests, lost emails and misplaced files. Add or remove users to collaborate with who you want, when you want, in real-time. Securely define roles and permissions. Drag and drop files anywhere on top of a request item and it will automatically be uploaded and matched with the request. Queue up requests, inquiries and follow up questions in the request activity feed using Comments. See who did what and when. Easily provide access to last year's engagement for clients to recall everything that was provided. Gain the visibility you need to effectively manage an engagement. Keep staff and clients on the same page with real time status updates that allow staff to switch between engagements, as information becomes available. My Portfolio provides a holistic view of all engagement metrics so you can instantly see where things stand across your entire portfolio. 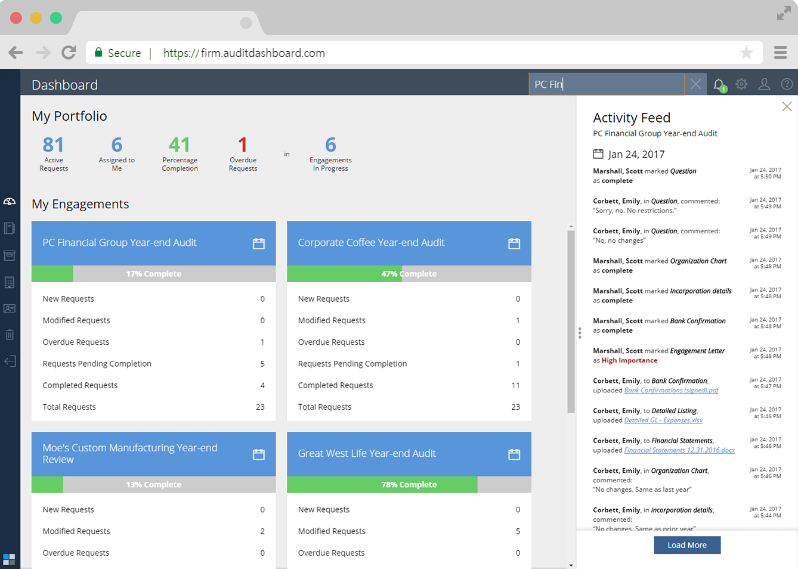 The Activity Feed tracks all engagement activity and provides a real time status update that eliminates irritating meetings and follow up. Customize notifications to get alerted when a file is uploaded, you are assigned a request or want to receive an engagement status update. Automatically track the number of new, modified, overdue, pending completion, completed and total requests. Customer branded to professionally represent your firm. Easily access the web-based platform anywhere, anytime. Complete support to get you up and running and help you stay on track.